Smolyan Lakes lie on the left slope of the valley of Cherna River (Black River) and below Orpheus’ Rocks and Snezhanka Peak (Snow White Peak – 1926 m above mean sea level) in the Rhodopes to the north. The lakes are scattered across the whole valley, from Orpheus’ Rock to the town of Smolyan. In the past there used to be around 20 lakes, but now only seven of them have remained as the others have become swamps. During the spring and the autumn small lakes are still formed in the places of some of these swamps, while others have been transformed into breeding ponds. The first lake, Keranovia gyol Lake (also known as Platenoto Lake), is situated at the end of Smolyan, on the left side of the road to Pamporovo and Plovdiv. Its lower part has been dammed and thus it has turned into one of the biggest lakes. Another smaller lake called Milusheviyat gyol Lake lies right above it. 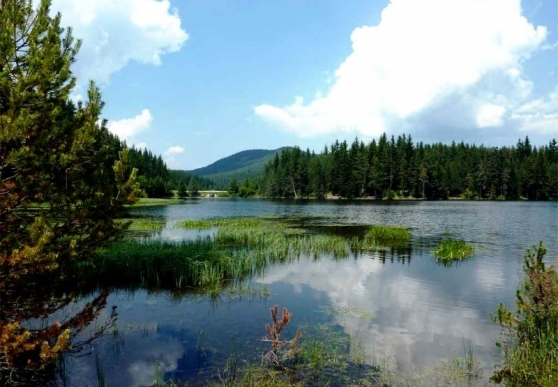 Farther still, just by the road to Devin, below Ezerovo Housing Estate in Smolyan, lies the third lake: Silazha Lake. A small reed-overgrown island is located at its lower end. This area provides suitable spots for camping and fishing. Another lake can be found at the big turn a little up along the road: Osmanoviyat gyol Lake. It is surrounded by a couple of smaller lakes but some of them dry up in the summer. Farther up the road to Smolyanski ezera Mountain Hostel (Smolyan Lakes Mountain Hostel) and then to the right lies perhaps the biggest lake: Lagera Lake (Camp Lake). This area offers suitable places for camping and fishing as well. The last three lakes are the most beautiful ones. They are the highest ones, situated just below the rocks. Trevistoto Lake (Grassy Lake) is located a little after the junction leading to Smolyanski ezera Mountain Hostel, on the road to the lift. Approximately 30% of its surface is taken up by a 1 m-thick layer of peat which is overgrown with different types of grass during the summer. Bistroto Lake (Clear Lake) is situated 6 metres away from Trevistoto Lake. The two lakes are connected by a small creek that percolates through the heap of boulders separating them from one another. Bistroto Lake is perhaps the most beautiful one of all. Venerable spruces stand on the eastern side of the lake with their gaze cast in its waters, while massive boulders are scattered around on its other side like small islands. The lake is no more than a metre deep and its bottom is clearly visible through the crystal-clear water. There is an artificial embankment at the lower end of the lake where the tourist trail to Studenets Mountain Hostel passes through. Matnoto Lake (Muddy Lake) is the highest one and it lies 200 m away from Bistroto and Trevistoto Lakes. It can be reached by a steep trail that starts at the road between the two lakes. Tourists must be careful while climbing towards the highest lake – there is a danger of falling rocks. The view is breathtaking. The lake is hidden in the thick spruce forests just below the rocks. It is difficult for light to reach it through the tall trees. Its waters seem dark and black and hence its name – Matnoto (Muddy). It is also the deepest of them all with its 4.5 m.